Black Lightning: Cold Dead Hands (DC Comics; $16.99) should be in your friendly comic shops and other fine bookstores within a week or two. I know this because I received my comp copies. 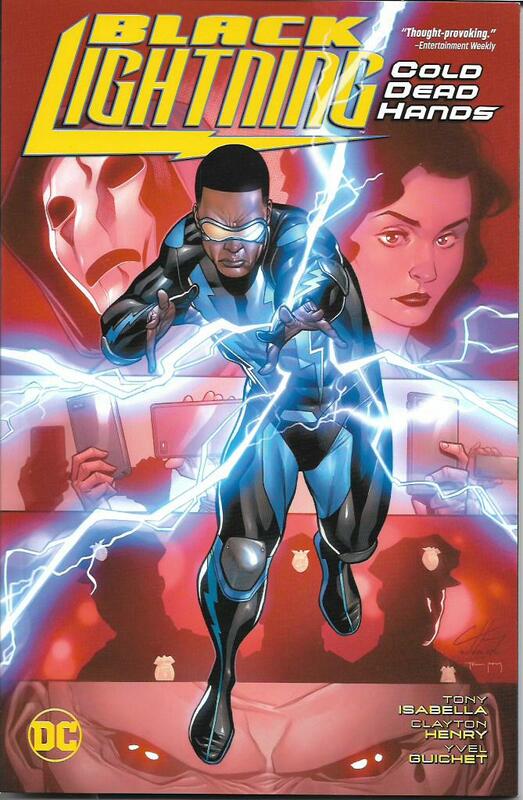 This trade paperback collects all six-issues of my critically-acclaimed six-issue series wherein I kind of sort of rebooted Black Lightning for a new generation. The series was magnificently drawn by the great Clayton Henry (with some pages drawn by Yvel Guichet), colored by Pete Pantazis, lettered by Josh Reed and edited by Jim Chadwick and Harvey Richards. Due in no small part to the talent of the above, I consider this to be the best work I have ever done in my nearly half-century comics career. There are those who would again reduce Black Lightning, DC’s most iconic black super-hero, to a Batman sidekick. My take on that is that my creation is a headliner, both in the comic books and in the spectacular TV series on the CW. Always forward is what I want for Jefferson Pierce. If you feel the same way, I urge you to buy this trade collection. Indeed, consider buying multiple copies to give to your family, friends, public and school libraries. Show DC that you want more of my Black Lightning. I assure you there is nothing that would please me more than writing new Black Lightning stories until they pry my…ahem…cold dead hands from my keyboard. In addition to the Cold Dead Hands issues, this volume has a never-before-published afterword by yours truly and a page of character sketches by Henry and Guichet. Uncharacteristic modesty prevents me from deeming this my pick of the week, but I do think it’s one of the best super-hero comics of the year. 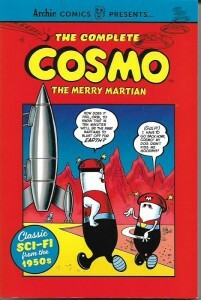 My actual pick of the week is The Complete Cosmo the Merry Martian [Archie Comics; $10.99], this despite the fact that nothing after page 165 of this collection is within light years of being as grand as the material before page 165. We’ll get to that in a bit. Complete Cosmo is a dream come true. Cosmo was one of my favorite comic books when I was a kid. Writer Sy Reit and artist Bob White captured both my heart and imagination with their clever tales of a brave young Martian, his not-so-brave sidekick and the many odd friends they make on their travels through the solar system. The six issues of the original run were filled with action, humor and even some pretty solid science information. Every story had a panel or two teaching readers about the solar system and doing so in such a way that the knowledge fit smoothly into the tales. I was crushed when it disappeared from the newsstands after the sixth issue. It wasn’t until years later I learned it had disappeared because there was never a seventh issue. My original copies of that original Cosmo series are well-read and even more well-worn. I’m delighted to have all those stories in a single volume. It’s a great collection and one I’ll be buying some additional copies of to share with comics friends. I recommend it as highly as I recommend Black Lightning: Cold Dead Hands. 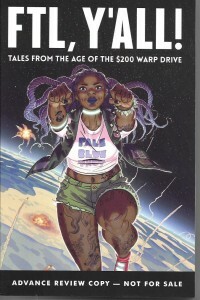 Iron Circus Comics sent me an advance review copy of its FTL, Y’All [$30], a 336-page comics anthology wherein very talented newcomers tell stories spun off from an intriguing “what if” query. What if faster-than-light travel was suddenly and fairly cheaply available to all? These “tales from the age of the $200 warp drive” are exciting in concept and include action, dread, humor, humanity and the burning question of where we are going. Not every one is a gem, but all are worth your attention. Some of the gems are: “Cabbage Island” by Mulele Jarvis; “Space to Grow” by N.N. Chan; “Story of a Rescue” by Nathaniel Wilson; “Solitary” by David Andry and Paul Schultz; “The Senior Project” by Maia Kobabe; and “My Stars and Garters” by Ainsley Seago. There are 21 stories in this anthology. Just one naysaying note. Clarity is lacking in a couple of stories. Sometimes it’s because the drawing is too cluttered. Sometimes it’s because the lettering is of the scribbled variety. I can’t address the art, but I can say that even newcomers should go to lettering fonts if their hand-lettering isn’t lacking. There is absolutely no art or honor in making your work hard to read. FTL, Y’All will be available at the end of October. It could make a pretty great gift for the science-fiction friend or family member in your life. Think about it. 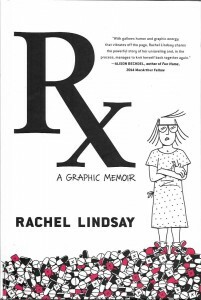 Rx by Rachel Lindsay [Grand Central; $28] is an unflinching graphic memoir of the cartoonist’s struggle with her bipolar disorder. If you deal with any mental illness of your own or with that of family members or friends, this work will kick you in the feels more than once. Take it slow if you must, but read this book. It’s a shining example of what we can do with comics. Lindsay needs a job to have healthcare coverage. She gets one at an ad agency where she develops ads for an antidepressant drug. It’s a position that makes it impossible for her to avoid thinking about her illness and difficult to avoid being overwhelmed by everything around her. It’s a heartbreaking situation with no “happy ending” beyond her determination to fight her illness and make a good life for herself. Her missteps and triumphs combine to make for a great work of comics art. I recommend it highly.